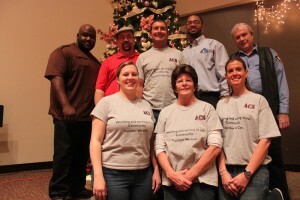 ACS attended a community outreach event on December 8th with the First Baptist Church of Raytown, where we helped wrap Christmas presents for needy families. The event was fun and exciting with tons of toys and gifts to wrap up in red and green Christmas paper with bright shinny ribbons and tensile. It was a day spent working together as a team in the spirit of the season. Our family at ACS would like to wish you and your family a wonderful and happy holiday season.